I spend a lot of time with a 12-year-old. A 12-year-old who plays goalkeeper on his soccer team and isn't afraid to throw his body in front of a charging opponent to stop the ball. A 12-year-old who has had two concussions and two broken wrists. He begs to go skiing and jumps at any chance to take his mountain bike out for a ride. He isn't afraid to send it. His mom is afraid to send it. In fact, that would be me. I can admit it here, I am afraid to send it. But after last weekend's ride with him, I have decided I have a few things to learn from the boy. We went riding on a new to me trail. He'd gone once before and begged his dad to take him again. Because I didn't want to ruin their fun, I agreed to give it a go. I was timid. I slowed them down but as I watched him fearlessly follow his dad, I was impressed with his excitement. When we got to the last half of the trail, the descent was the only way out of there, his voice played over and over in my head. "I'm going to just send it. Just send it. Just send it. 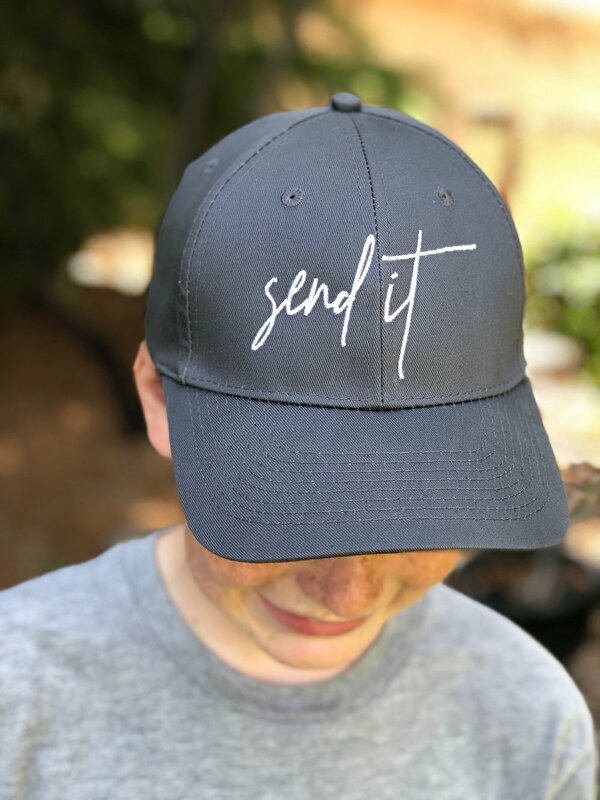 Just send it." I kind of sent it. I tried and then I wrecked as I knew I would and I knocked the wind out of myself and scraped up my elbow and my knees and bruised myself considerably. But I did have a personal victory...I didn't cry. Last time I wrecked like this I cried on the trail. But what 12-year-old boy wants to see him mom cry while mountain biking? Probably none. What 12-year-old wants to inspire a hat at his favorite local bike shop? I know one for sure!